Final Fantasy VII was the second game to take over my life. The first had been Sensible World of Soccer on the Amiga. But this was a completely different experience. Square had previously had some success with the Final Fantasy series but the seventh was a departure because it was in 3D. I'd never played anything quite like it before and I' never played a role playing game so when I noticed, shortly after getting my PS1, that every gaming magazine had it has its number one title I was curious to see what all the fuss was about. Initially I was sceptical as I didn't have a clue what was going on. The game begins with (a then) beautiful steam punk cut scene and then suddenly these odd, slightly deformed characters are on a train. They were talking to each other when I pressed the circle button (the Japanese default) but I had no clue what about. Shortly afterwards Cloud, the main protagonist, is on a station platform and as you edge him forward to join his 'friends' the screen suddenly goes very odd. This, as soon becomes apparent, is your first 'random battle'. The scene changes to a more detailed image of Cloud and he's faced with a brief turn based battle against an armed soldier. And Cloud? Well Cloud is hitting him with a big fricking sword. Initially confusing the 'Battle System' quickly shows its depth as you take control of up to three characters at once. It's a balance between healing, hitting and spell casting. I loved it. 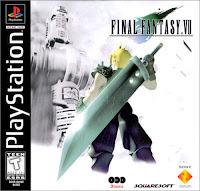 However the real genius of Final Fantasy VII was the story and the characters that inhabited the game world. And let me make it very clear this was a 'world' in, well almost, the real sense. 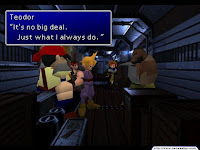 The moment when your characters leave the city of Midgar for the first time and you realise that there is a whole planet to explore is still one of my all time favourite gaming moments. Cloud, Tifa, Barrett, Yuffie, Red XIII, Cait Sith, Cid, Vincent and Aerith are all fully realised characters. Their story is one about saving their planet and although that sounds cheesy the tale is told in a truly compelling way. When one of the main characters dies the game changes in feel because suddenly you realise that Square are happy to do the completely unexpected and the battle to beat one of the most iconic gaming villains of all time, Sephiroth, becomes a genuine revenge story. Not just for the characters but for you, the player. Seriously you take that violent death very personally. There are side quests aplenty, I spent two days breeding Chocobos (weird giant birds, generally yellow) that you could use to get to far flung parts of the map, just to get hold of one spell. I bought it again recently from the PSN store and it is a game from a bygone age. A bygone gaming age anyway. But it still has a charm that no other Final Fantasy title has managed to muster, a truly wonderful title that ate away 80 plus hours of my life back in 1997 and I still rank it as my favourite ever game. It's iconic because it changed the way gamers in the West perceived JRPG's (Japanese Role Play Games) and paved the way for Square to milk the Final Fantasy name for all it was worth. The latter is a shame in many ways, mostly because FFVII felt like such a pure gaming experience. If you've never played it and can cope with some dated graphics then I'd highly recommend it. You'll get totally sucked in by the story (which is a bit bonkers at times) and you'll fall in love with the characters and soundtrack. There's talk of a remake, there has been a sequel in the form of a film, a prequel on the PSP and PS2 third person shooter for one of the characters, but it started with this. Truly one of the greatest games of all time. 'Then I'll be going now. I'll come back when it's all over' - Aerith.